Another firm family favourite. I had some apples left over from a work do. I stewed them with some rhubarb, then made a crumble mix with some wholemeal flour, butter, some sugar and the rest of the ground almonds. 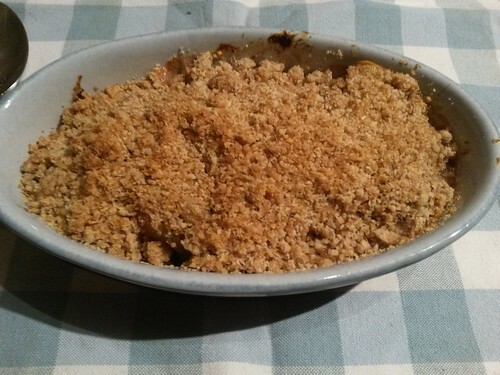 It’s the first time I’ve put ground almonds in crumble – and definitely not the last. Now it’s time for a confession. My first kitchen failure on this project. I tried to use the rest of the sugar and the condensed milk to make some fudge, but it just didn’t work. In fact the texture was all wrong and it tasted horrible so it went in the bin. This does mean the condensed milk and sugar are all gone now though. This continues the old favourites theme by delving even deeper into my past. Fishcakes are a firm favourite in my family and probably the only main meal Mum cooks that we used to eat 25+ years ago. Fishcakes are a great way to use up leftover potato. I mash the potato (skin on is fine), add a small finely chopped onion, and the fish. 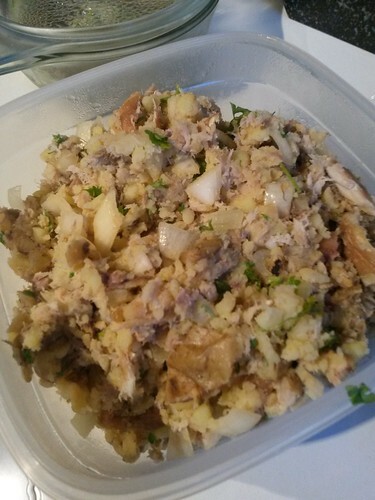 For fish my mum always uses tinned tuna, but I like smoked mackerel, about a 2:1 ratio of potatoes to fish. For a bit of extra flavour I add a splodge of umami paste if I have any on hand, as well as some chopped parsley. You’ll need three shallow bowls. In the first, put some flour and season it with salt and pepper. I also add sumac if I have any. Beat up an egg in the second (you may need more than one if you’re feeding a family). And put breadcrumbs in the third. Mum always uses homemade but I cheat and buy breadcrumbs. 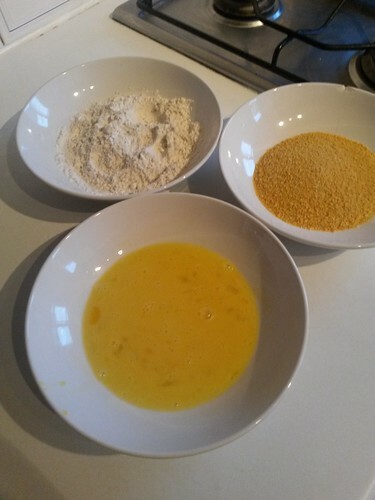 To make the fishcakes, roughly shape a handful of mixture into a ball and flatten it slightly. Repeat until the mix is used up. Heat 1-2 cm of oil in a frying pan. Fry the fishcakes until golden brown and drain on kitchen paper. 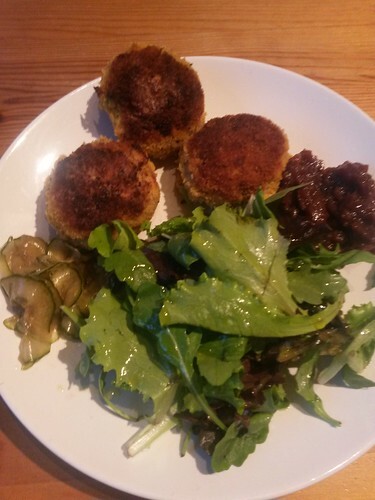 I found some beetroot chutney in a cupboard so I served it with the fishcakes, as well as some cucumber pickle I’d made earlier and some salad. I didn’t quite use up the breadcrumbs, but that’s ok – I’ll save them for the next time I make fishcakes! Although I didn’t finish the breadcrumbs I did finish the plain flour and used up some potatoes. Check my progress on the list. One thing I’ve noticed about my storecupboard project is that I keep returning to recipes from my past: old favourites or food that has some kind of nostalgic value. This is one such meal. It comes from my friend Marissa, who I lived with for three years back during university and for a while afterwards. Marissa, a Sri Lankan New Zealander, shared the food of her other homeland with me and I loved it – soon developing a tolerance for spicy food as she had a tendency to “slip” with the spoon as she added chilli powder! 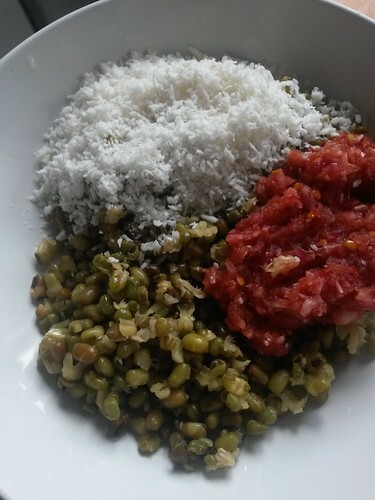 One day she cooked a dish of mung beans, accompanied by a simple sambal known as lunu miris (though according to Wikipedia it is more properly known as katta sambal). 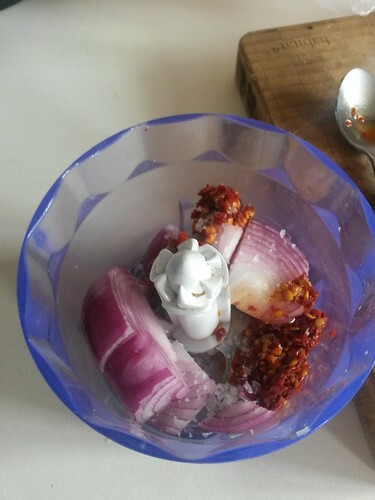 She chopped some red onion very finely, adding salt and lots of chilli powder, and finally some lemon juice. 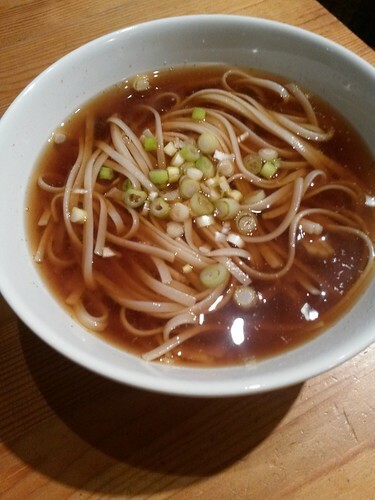 She served it on top of the mung beans, along with some dessicated coconut. Of course in Sri Lanka fresh coconut would be used. 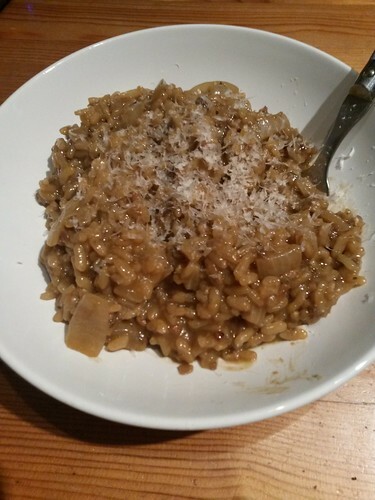 I had some dessicated coconut and some mung beans to use up, so this recipe was perfect. 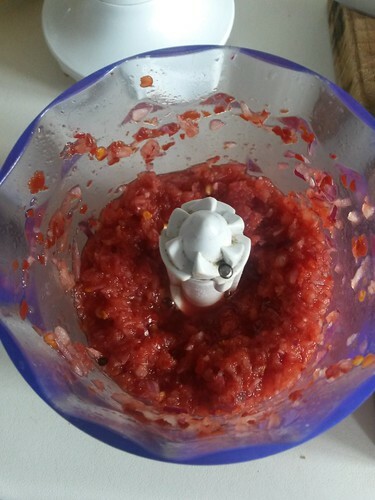 I cheated and used my mini food processor to grind everything up. Instead of chilli powder I used minced chilli, and quite a lot of it as I find the stuff in jars very mild. I used lime juice as I think this is more traditional. In Sri Lanka they also often use a dried fish called Maldive fish. 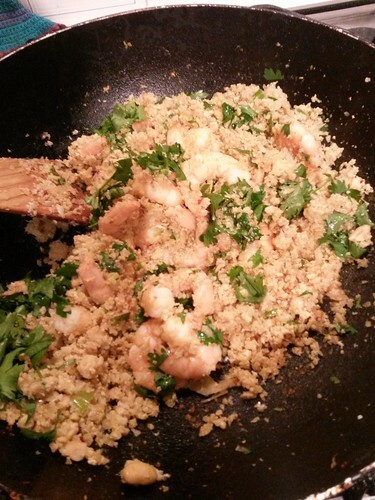 I added a few splashes of fish sauce to add a bit of fishyness to it. Served on top of boiled mung beans with a generous amount of coconut, it brought back some very good memories. One more category crossed off the list – the beans are all gone now! Soak the beans overnight and cook them. Sauté the onions in the oil until the are soft and clear. Add the tomato paste, coconut cream and seasonings, stirring until they form a smooth and creamy sauce. 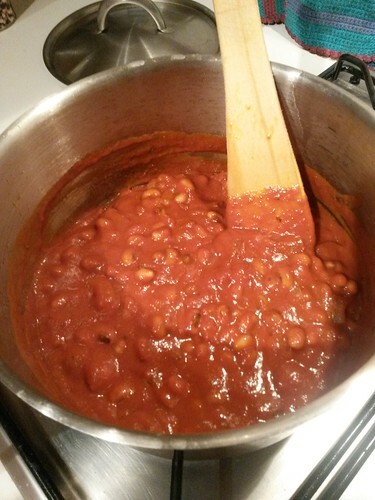 When the beans are cooked, drain and combine with the sauce. Serve immediately, or, for even better flavour and texture, leave to stand and reheat when needed. I took this for work lunches for a few days, with the last of the brown couscous. So that’s couscous, black eyed beans, coconut cream, and tomato puree checked off the list (tomato puree wasn’t even on it but I found it lurking in the fridge), and I also used up some cumin and paprika. It’s been a busy couple of weeks here at Knit Your Own Yoghurt. I started a new job, and jumped in head first with evenings and weekends. The next few weeks are set to be even busier, for work and other reasons. There’s a Little Waitrose on the way home from the new job. 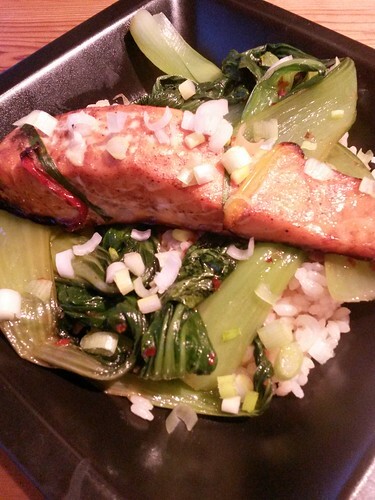 I popped in and saw a single fillet of marinated salmon reduced to clear – perfect! Usually the smaller supermarkets only sell two packs of salmon fillets. A colleague also recommended the most amazing greengrocer in Camden Town, Parkway Greens. I picked up some pak choi, cauliflower, spring onions and some other bits and bobs. I cooked my remaining sushi rice and added a slosh of rice vinegar and a bit of sugar (as I’m already out of mirin). I cooked the pak choi with a bit of sesame oil and fish sauce. It was a delicious meal. After that I had no more rice, but I made cauliflower fried “rice” from The Londoner’s recipe and used up the rest of the peanuts. Finally an entire category of the list is done!